January 28, 2013 (SOUTH BURLINGTON, VT) - In response to customer demand for a durable, ultra-compact computer, Logic Supply (www.logicsupply.com), a leading provider of specialized systems for industrial and embedded applications, announces the arrival of the NUC-based AG960 Core i Compact Multimedia Computer. Its flexibility, computing power and compact size makes the AG960 ideal for multimedia applications such as digital signage and advanced kiosks. Ultra compact - Based on the Intel NUC form factor, the system fits in the palm of your hand and allows for discreet placement in space constrained environments. Low noise - Designed with a single centrifugal side blower fan, the system remains cool and quiet during operation. Advanced processing - With a 1.80 GHz Intel Dual Core i3-3217U processor and the QS77 chipset, it eliminates the typical tradeoff between computer size and speed. Energy efficient - The low TDP (Thermal Design Power) processor allows the system to run at under 30W, staying cool and ensuring stability, maximum uptime and longevity. Multimedia Capable with Essential I/O - With Intel HD Graphics 4000, four 2.0 USB ports, two HDMI, the computer can power HD video and dual displays making it ideal for graphic-intensive applications. The AG960 is based off the Intel NUC (Next Unit of Computing) form factor, but this embedded version varies from its commercial cousin in important ways. The case is 100% metal and constructed of high-quality rust protected steel to ensure longevity and durability. The unit boasts an additional front panel USB port and user power button with a LED indicator. View the AG960 or browse the complete lineup of Digital Signage computers from Logic Supply. 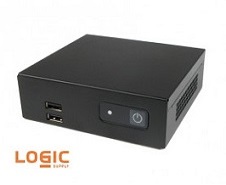 About Logic Supply: A leading industrial PC company, Logic Supply is powering innovation worldwide. Designing and manufacturing small, rugged computers specifically engineered for harsh environments, the company serves a variety of industrial and embedded markets. In addition to its extensive product line, Logic Supply offers custom development as well as an end-to-end OEM service program. The result for customers is a true partnership characterized by speed, flexibility and value. Visit the Logic Supply website at //www.logicsupply.com/.